The teaching world is fraught with challenges and obstacles. Helicopter parents, huge class sizes, faculty meetings that test the limits of your patience. In all of this, it’s good to know that someone’s got your back (and a spare dollar for a Diet Coke from the vending machine). Here are 15 moments you’ll recognize if you’ve found your teaching BFF. 1. Your teaching BFF knows exactly how you like your coffee. And sometimes gets you one without even asking, like a quiet, all-knowing caffeine angel. 2. They can always talk you off a ledge. Your teaching BFF is the one you go to after the tub of glitter was spilled on your floor; your computer deletes the 45-question final you were working on; or you get a passive-aggressive email that was sent to the entire school, but you know it was directed at your department. Ten minutes together and you’re cool as a cucumber again. 3. Your teaching BFF has your back. When you’re about to leave for school and your kid starts projectile-vomiting, you know that after just one text, your teaching BFF will email the principal, make copies of your lesson, and help the substitute get situated. Why? Because you’d do the same in a heartbeat. 4. They tell you yes. When you have big aspirations and lofty goals, all for the betterment of your students, you need someone to tell you to go for it. 5. They also know when to tell you no. 6. You can have an entire conversation with just a look. When an administrator shows a slide in their PowerPoint that says, “THIS IS ABOUT COMPLIANCE, NOT CREATIVITY,” you turn your head and slow blink, your BFF flares her nostrils, and both of you know that nothing else needs to be said. 7. You’ll both share your most prized supplies. Your friendship runs deep enough that you trust each other with the teaching world’s least-likely-to-be-returned items: Expo markers, duct tape, and staplers. 8. You have fun doing menial tasks together. Entering grades, cutting up sentence strips, sorting your file cabinet … somehow these tasks are 90 percent easier and more fun together. It’s like parallel play, but for grown-ups. 9. You auto-default to partner Halloween and spirit week costumes. Bert and Ernie. Ms. Frizzle and Liz. Peter Pan and Tinker Bell. Tim and Moby. Etc., etc., etc. 10. You always get together in the summer because two months apart is too long. And when you do meet up, you marvel at how well rested you both look. 11. You keep each other informed about important things. 12. You inspire each other. You need a unicorn in your life. Your teacher BFF is your unicorn. 13. Your teaching BFF is practically certified in cheering you up. They seem to have some sort of ESP to know exactly when you need a laugh or just some regular teacher support. 14. If one of you changes schools, it feels like the end. It’s like everything that was right in the world is now wrong. 15. But you know you’ll end up back together … like always. Nothing can keep you apart. Check out this video of Jasmine from Tame the Classroom talking about the importance of teacher BFFs. She gets it. 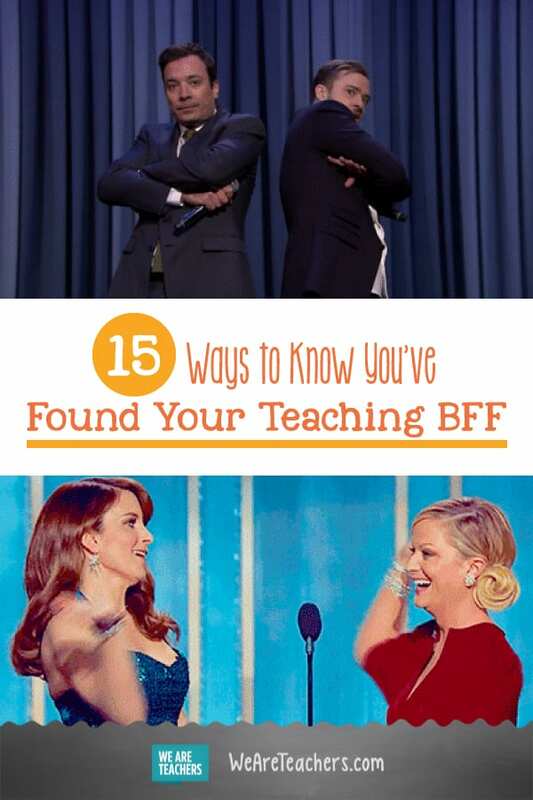 Are you in need of a teaching BFF? Find a virtual teacher buddy in our WeAreTeachers HELPLINE group on Facebook. Plus, take our teacher BFF quiz.